Free choices to meet everyone's needs, beautiful design with loud and clear sounds, you'll love all the amazing tunes and ultra easy to set up. Quality ABS material construction, more comfortable human bionic button, good decor for your house. 12V A23 battery for transmitter (included), no need battery for receiver just simply plug into any wall outlet. While press the transmitter, the receiver rings up, LED indication light flash alarm at the same time. Perfect for home, office building, residential, villa, bank, restaurant, hospital, dorm rooms and college etc. 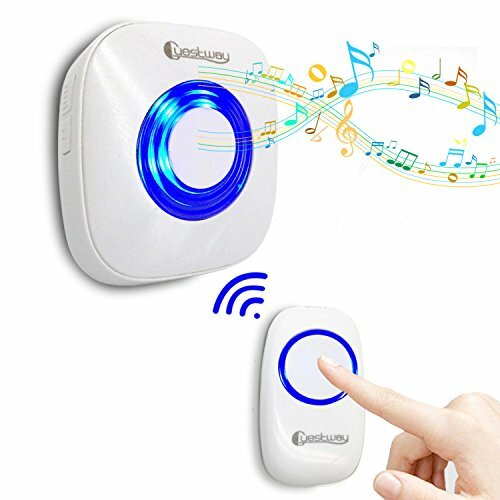 Great for those who don't have good hearing or deaf, can be alerted by the blue light. Not just a door bell, also can be used as a pager for kids bed room calling in the morning, pregnant or patient calling helpers in emergency etc. Notes: Use quality battery to keep the maximum wireless range. Avoid installing transmitter on metal doors since metal is not easy for signal to transmit.